The data originators have questioned the reliability of the transmissometer calibration. These data should be used with caution. It should be noted that the cruise report makes a note that the PAR sensors were installed on the first titanium cast (p.23). 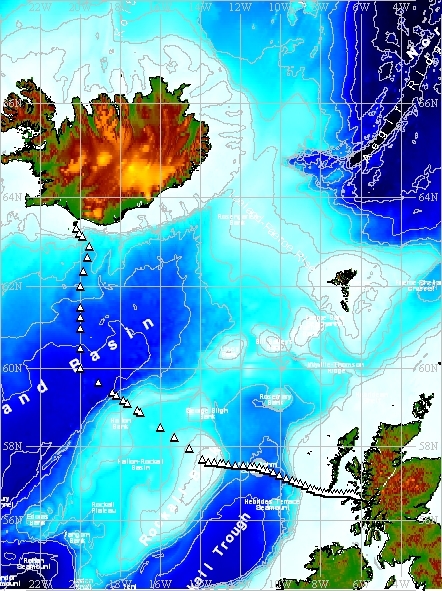 A total of 86 CTD casts were performed during the cruise which sailed between Reykjavík in Iceland and Dunstaffnage on the west coast of Scotland, incorporating the Extended Ellett Line and Wyville Thomson Ridge area. 8 of the casts deployed during the cruise were housed in a titanium frame equipped with dual temperature and conductivity sensors. The CTDs were located within and near the bottom of the rosette frame which held 24 10-litre Niskin water sampling bottles. Comparison between primary and secondary temperature and conductivity sensors on the titanium casts suggested primary sensors functioned well for the duration of the cruise, except for a few casts where the secondary sensors appears to be delayed by 1 or 2 seconds compared to the primary sensor in areas of sharp change in values. Data arrived at BODC in a total of 86 ASCII, WHP (WOCE Hydrographic Program) standard files with 8 of these files representing the CTD casts from the titanium frame deployed during cruise D340A. These files contain 2db-bin averaged data including temperature, salinity and dissolved oxygen channels processed to WOCE standards alongside concurrent fluorometer and transmissometer data. Station IB17 is one of the fixed CTD stations, which together form The Extended Ellett Line. The line lies between Iceland and the Sound of Mull (Scotland) crossing the Iceland Basin and Rockall Trough via the outcrop of Rockall. As part of this initiative, CTD dips, together with associated discrete sampling of the water column, have typically been carried out annually at this station since September 1996.